There’s a quote that says something like “If you show a child the same thing five times in the same way and they still don’t get it...it’s not the child who is the slow learner.” Hearing this, I find myself asking why then, do we as a nation largely approach education this way? We know, based on scores, outcomes, and research that what most traditional schools are doing doesn’t work for most kids, but rather than instill and insight widespread change, we continue on with more of the same. Traditional public schools tend to have a one size fits all approach to education. I am not much of a history buff, but it seems to mimic industrialization and the need to attempt to educate as many people at a time as possible using the same methods. It’s time to adjust with the times. It’s time we change things based on trial and error observations and adapt a more methodical, science-like approach to education. Maria Montessori was the first female doctor in Italy. She created all her didactic, hands-on materials based on observations of what actual children gravitated towards and what worked for them, and adjusted accordingly. All of the lessons incorporate movement, honoring a young child’s need to move his body, but making it purposeful, and thereby helping them learn better by using the mind-body connection. Montessori lessons follow a child’s interest. When a child is not interested in a subject, teachers are taught to adjust their lesson or materials to stimulate excitement, changing the environment to fit the child’s needs, rather than giving up in frustration and exhaustion when one material doesn’t suit every unique child. 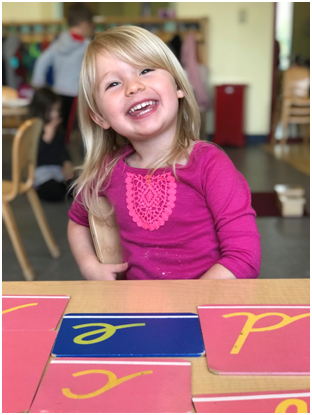 The freedom in the Montessori curriculum and variability in evidence-based materials allows the teachers to accommodate different types of learners - whether they be kinesthetic, visual, or auditory. Many Montessori lessons incorporate all of these senses into one lesson to ensure every child absorbs the concept. Sandpaper Letters and Numbers, for example are letters and numerals on boards the child traces one at a time. They start by watching the teacher trace without saying anything, focusing on the movement and muscle sensations without yet adding in the confusion of words. Once the child has completed this, if they seem engaged, the teacher may trace the letter or number again, this time making just the letter sound or announcing the numeral on the board. The child then traces the symbol and makes the sound or numeral. Most children are shown three at a time. These three are repeated to the child before the teacher adds a level of difficulty by mixing the letters or numbers up in order. She will then ask the child to point to “1,” point to “2,” and “point to 3.” The last level of difficulty is where the teacher puts the numerals or letters back in their original order and the teacher points to one, this time without naming it, asking the child to do so. From here the child will practice the lesson with the same 3 letters or numerals several times as repetition is essential and creates neural pathways in the brain. Children in a Montessori classroom, in fact, are given however long it takes them to master them. The Montessori curriculum recognizes that what takes one child a week may take another several months, and that’s okay. For children that need more movement to help them focus and learn, the teacher may set the letters or numbers on a rug at one end of the room, and ask the child to identify a sound or numeral before finding it’s match on a rug at the other end of the room, engaging their body and their working memory at once. This one lesson is an example of the way all Montessori lessons cater to many different types of learners, ensuring that it’s not just the naturally brightest children, for whom school comes easily, that flourish, but all children in their own time and their own way do so, when given the support and means to learn in their own way. Not only do Montessori materials honor different types of learners, the curriculum also grants teachers the freedom to follow each child’s unique inherent interests. Instead of trying to meet certain standards and force little ones to be average in all subjects in order to achieve certain test scores, Montessori teachers are able to honor what it is that excites each child as an individual person - what sets their soul on fire. What makes them different. In this way, we hope, they can be truly great at something, fulfilled, and genuinely happy. Happy people encourage others, which spreads, and unearths other happy people. It’s our job as parents and early childhood educators to stoke and inspire curiosity - to create environments where learning is fun, done with an open mind, and instill a lifelong love of exploration. This is how we will change the world.